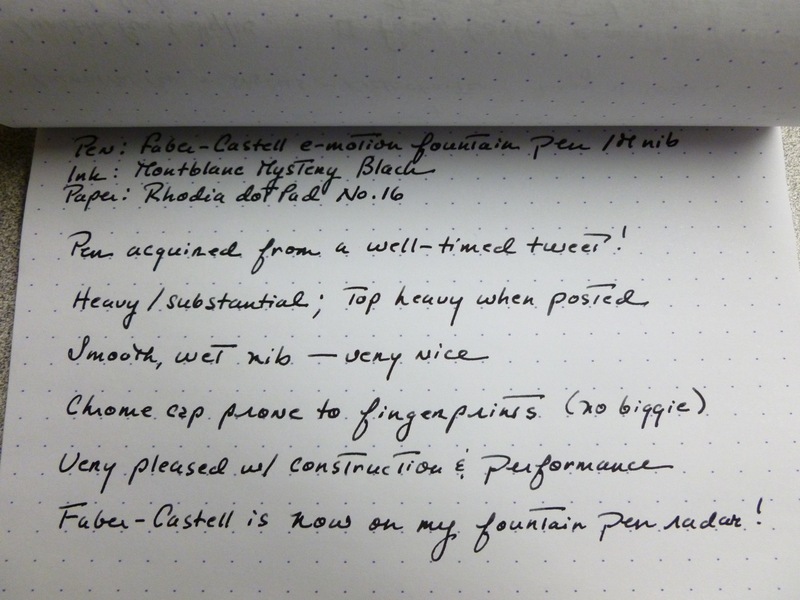 I had the Faber-Castell LOOM fountain pen on my radar for along time before hitting the “Buy Now” button. I can’t explain why as I’ve read and seen numerous favorable reviews, and have had nothing but great experiences with Faber-Castell nibs. The price— a modest $40-ish— wasn’t the hurdle, either. Whatever the reason, I found myself picking other pens to purchase while the LOOM languished on my Someday/Maybe list. In October 2014, Fountain Pen Hospital ran a “flash sale,” and as I casually browsed the offerings, I noticed this Lime Green LOOM for a slightly reduced price. I like lime green almost as much as I like orange (when I’m in the mood for something bright), so why back-burner this pen yet again? I inked the pen as soon as it arrived and found that any niggly hesitation I’d had was not at all warranted. The oversized cap sort of put me off initially, as it looks as though it’ll add an unwieldy amount of weight to the back of the pen when posted, but I haven’t found that to be the case. 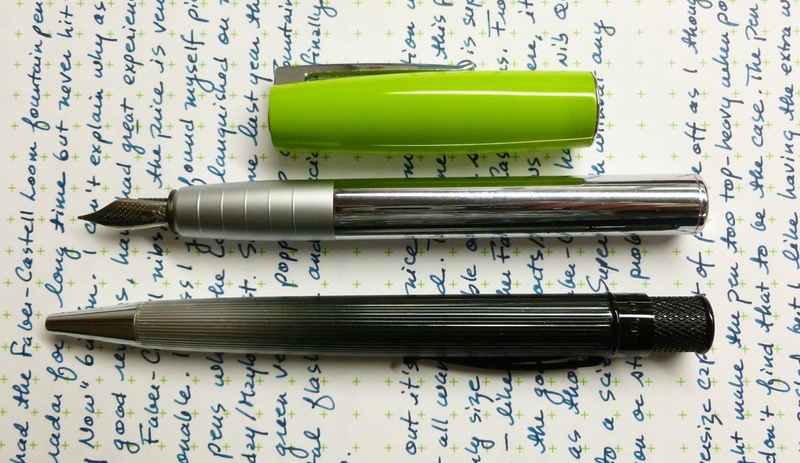 The pen is light and on the short side (4.7″) when unposted, and though perfectly usable, I prefer the added weight and length posting the cap adds (posted length is 5.9″). The cap snaps on with a convincing click, and posts deeply and securely. Even though the cap makes the pen look a little bit like a bobble-head, it’s actually not an issue. 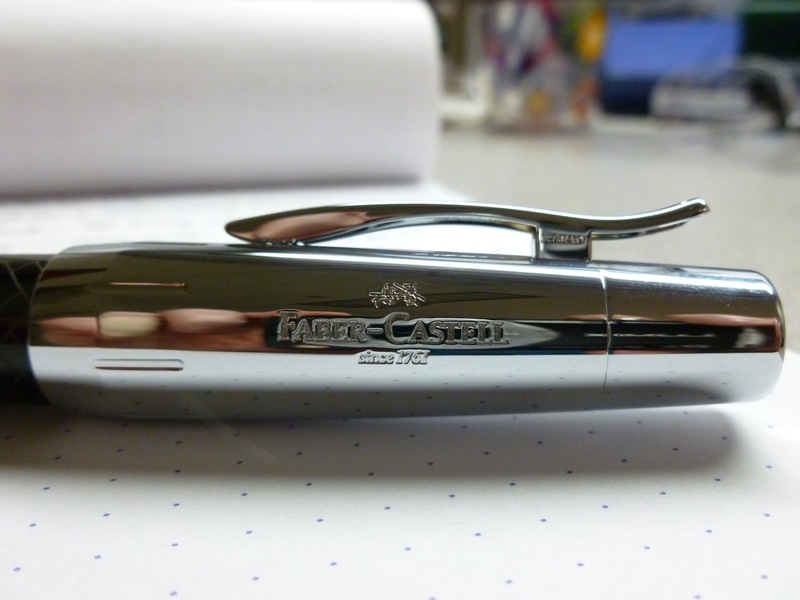 This pen’s body features the highly polished “Piano” finish, so, of course, it’s a fingerprint magnet. I give the pen a quick wipe after a writing session and all is well. If fingerprints give you a nervous twitch, you’d be better off choosing a LOOM with the “Metallic” (Matte) finish. The matte metal section features a series of raised ridges that help with grip, though I have to admit that I find the section to be a little slippery nonetheless. Because of the curved shape, and the fact that there isn’t any kind “stop” at the end of the section, my fingers tend to drift towards the nib, despite the added ridges. Since I’m a “low-gripper,” this doesn’t really bother me, but it’s worth noting. The clip is spring-loaded and substantial, the branding is subtle, and the lime green color of the cap (other colors are available) pops in a wonderfully citrusy kind of way. But what I REALLY love is the nib. The fine nib on this pen (the only size available during the FPH sale) is super smooth— just like all of my other Faber-Castell pens. Because I’ve read so many great reviews about Faber-Castell nibs, even on the economical models, I have to assume that this is a company that has their nib QC down to a science. 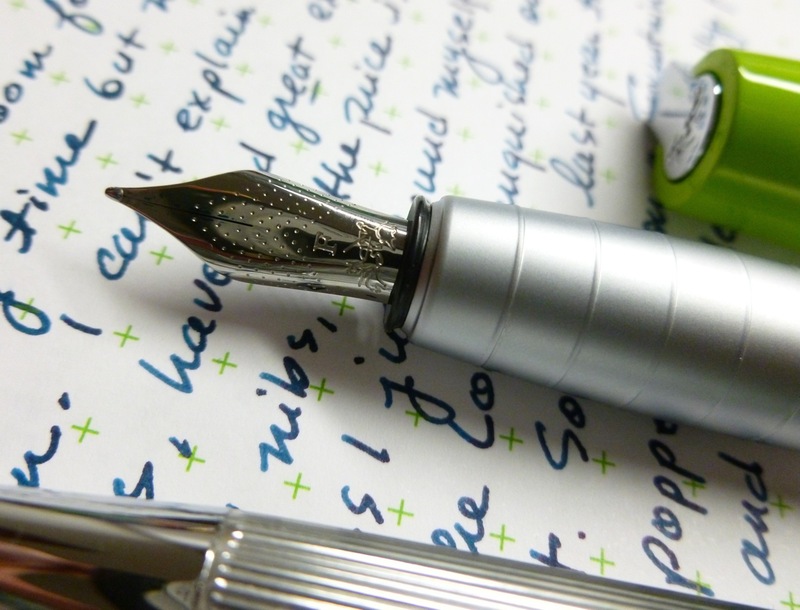 Pay a little or pay a lot— you still get a consistently great nib. 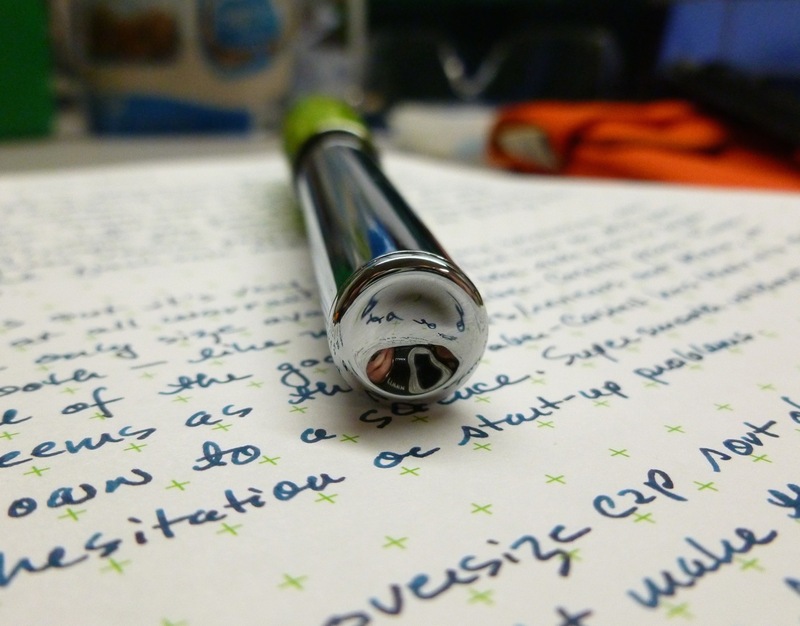 I’ve had zero start-up issues, writing is silky smooth, and there’s never been a skip or a hesitation. Available from a variety of vendors (including Faber-Castell), in a number of colors, and in both matte and gloss finishes, the Faber-Castell LOOM is a pen that delivers great performance at a very reasonable price. Fountain pens not your thing? The LOOM is also available in rollerball and ballpoint formats. After spending the past few months with this pen, I’m glad I finally moved the LOOM off of my Someday/Maybe list and onto the list of pens I own. It’s one that I keep consistently inked, usually with Sailor Yama Dori, and use it often for letter writing, journaling, and note-taking. Because— wow— that nib! Sometimes things go wrong. Sometimes things go wrong with PENS. And when things go wrong, some companies leap over tall buildings in a single bound, some gingerly scale small fences, while a few can’t be bothered to get off the couch. Some examples? Don’t mind if I do. 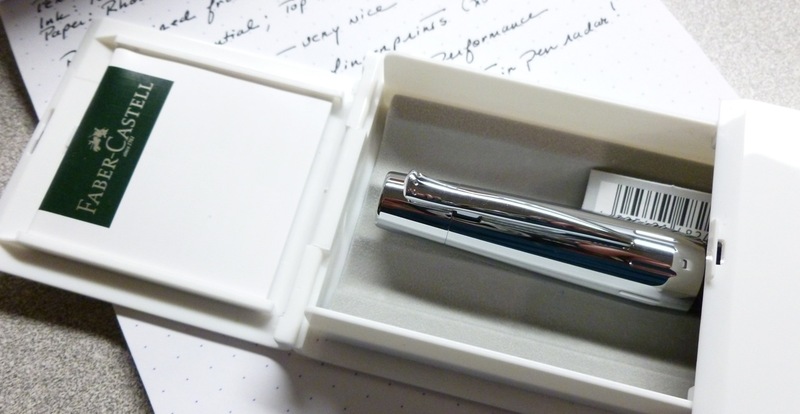 TWSBI STORY #1: I’m in love with my TWSBI Mini (as you can read here), but soon after I posted my review, blobs of ink would periodically fall onto my paper from the nib. I flushed the pen, re-inked it, to see if that made a difference, but it didn’t. So I emailed TWSBI and received a very quick response from Philip Wang. He was as baffled as I was, but offered to take a look at the pen to see if he could diagnose the problem. Just as I was getting ready to box up the pen for mailing, I noticed an o-ring in my pen case, right near the elastic loop where I keep the Mini. Ah ha! By looking at the schematic drawing that came with the pen, I was able to determine that an o-ring was missing from the piston end of the pen. It obviously came off when I dragged the pen through the case’s elastic loop. Once replaced, no more maddening drips. So the pen wasn’t at fault, but HAD IT BEEN, Philip was prepared to make it right. We exchanged a few emails over the course of a few days trying to sort this out, and the replies were always prompt, courteous, and sincere. I came away from the exchanges an even stronger TWSBI fan. THAT collection is bound to grow. TWSBI STORY #2: This weekend, my husband and I were looking over past American Express statements for some reason, and when we got to the October 2012 statement, I noticed what appeared to be a duplicate charge for a TWSBI purchase. One charge was via PayPal, while the other appeared to be from TWSBI itself, both for the same amount, on the same day. Being a saver of receipts, I put together an email with documentation, and sent it off (Sunday evening), feeling like a bit of a stooge because I’d just noticed an October 2012 problem in February 2013. (Kick self.) A little before lunch on Monday, I received a PHONE CALL from Philip. He’d investigated and found that there WAS, for some reason, a duplicate charge, which he promised to immediately refund via PayPal. He’d even investigated my previous purchases and found nothing amiss. Who knows why this happened- we’re both baffled- but the whole thing was cleared up quickly and professionally, and WITH A PHONE CALL. FROM A PERSON. Yeah, I’m happy. TWSBI, you made my day. After I posted the review of my Faber-Castell e-motion, a commenter asked about interchanging nibs between the e-motion and BASIC pens. Hmmmm…I couldn’t answer that, so I contacted Faber-Castell, and received a lightning fast response. (No, they can’t be interchanged.) So many times, an email to a company seems to fall into a black hole, but Faber-Castell reads and responds. QUICKLY reads and responds. The issue: I own both the carbon roller, and clicky ball-pen. I wanted to get the fountain, however the roller uses the same rubber-grip screw-into-carbon construction, and over time, the plastic at the base of the threads have cracked and the thread section is holding on, barely. The response: I’m very sorry to hear that you are experiencing a problem with the pen and I would like to correct the situation for you. Please contact me at consumer@fabercastell.com so that I may assist you in replacing the broken part. When I received this Lamy Safari Charcoal (EF nib) from Daly’s Pen Shop, the blasted thing would not write. I cleaned it and coaxed it with different inks, but couldn’t get anything more than a dry, dry line. I emailed a few photos of the issue to Daly’s, and received a quick offer to replace the pen. Daly’s tested the 2nd pen before mailing it out (smart move). Happy ending. Happy customer. I ordered an EF nib for my Kaweco AL-Sport from JetPens. Once installed, I was disappointed to find that the nib performed horribly; not at all like the buttery smooth EF nib on my Kaweco Liliput. Once again, I emailed a couple of photos showing the inconsistent and dry lines, and by the next day, a new nib unit was on its way to me. Problem solved without breaking a sweat. 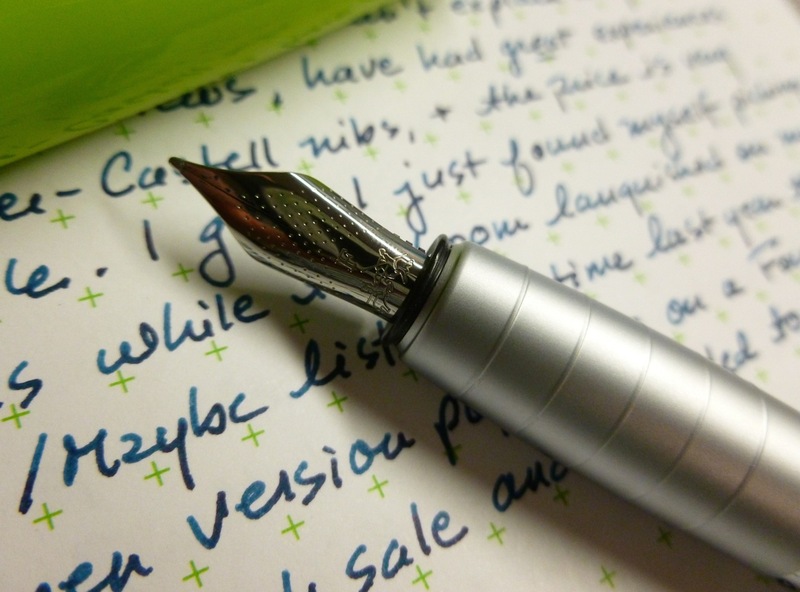 I’ve been eyeing a TWSBI Micarta for a LONG time, but have been a little put off by some of the reviews that call it a “dry writer.” Since I’m not, as yet, able to adjust my own pens, I’ve been hesitant to order one. I noted this dilemma in an email to The Goulet Pen Company, and received a quick and helpful response. 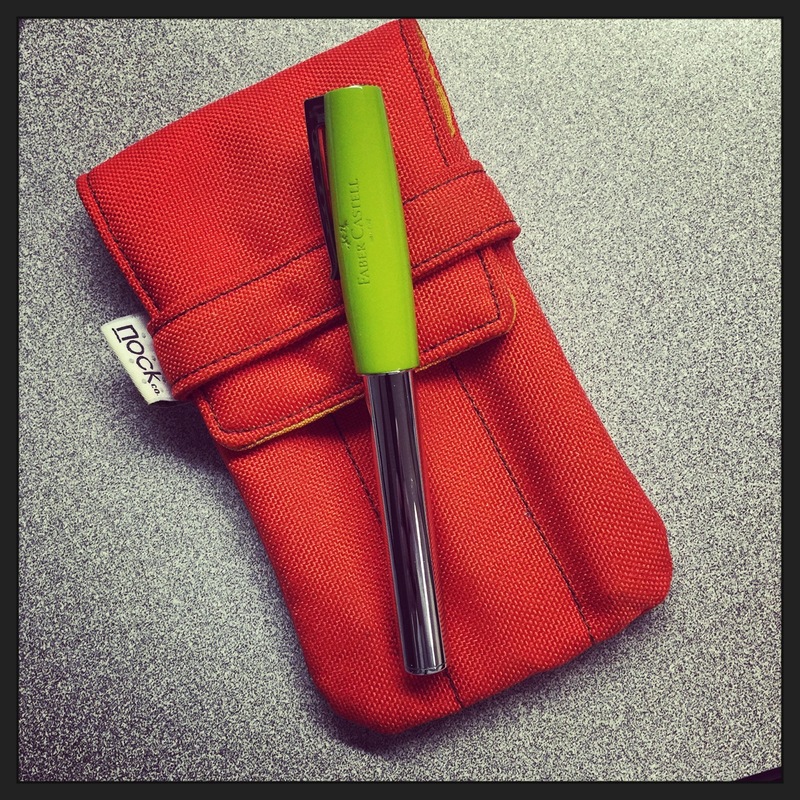 The folks at Goulet Pen will happily ink up and test a pen prior to shipping to make sure that it flows properly. All it takes is a mention in the comments section of the order form. Good to know. I’m a big fan of Levenger products and am knee deep in Circa notebooks, Circa punches, True Writer fountain pens, and even a piece or two of furniture. Their products are strong, but their customer service could stand to kick it up a notch or two. 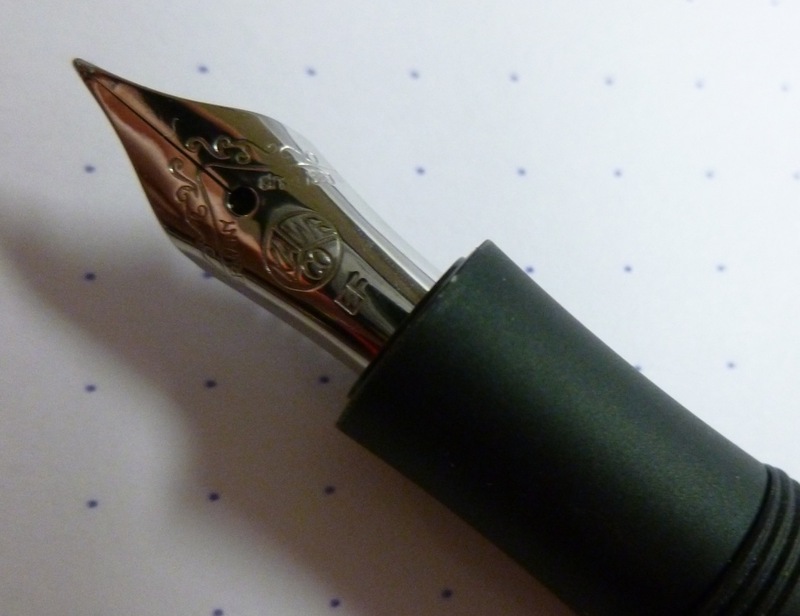 In mid-December, I used a promotional gift card to place an order for a Pilot Prera with free ink, then applied a promotional discount to the bundle (after first checking with Customer Service to verify that the discount could be applied). “Yup, no problem.” Shortly after that, I received a back-order notice. Fine, I’m in no hurry. Sometime in January I started wondering where my pen and ink were, so I checked the order status online and found that the order had been cancelled. Cancelled without notification. Yikes. AND my gift card still showed that it had been debited for the order! Double yikes. I called and spoke to someone who said that they would pass along the issue to “Customer Service” (who was I speaking to?! ), and that they’d get back to me. Never happened. So I called again, and reached someone who did all the right things. She started from scratch by re-loading the gift card, then placed the order a second time. Some time after that the Pilot Prera arrived (with free shipping, for my troubles), and it’s a dream. (But that’s another story.) The ink, though, has yet to arrive. After emailing yet again, I was told that the original receipt date has been pushed further into February. And so I’m waiting nearly two months for a bottle of Levenger Cobalt Blue. I have every confidence that I’ll receive the ink, just as I received the pen, but the problem is that I’ve been doing the bulk of the work in this transaction. I’ve been emailing. I’ve been calling. I’ve been waiting. I have no problem waiting as long as I receive timely communications whenever there’s a change. Maybe it’s a fluke, but this transaction ran off the rails a few times. If I wasn’t such a fan of their products, would I stick around after this falderal? Probably not. 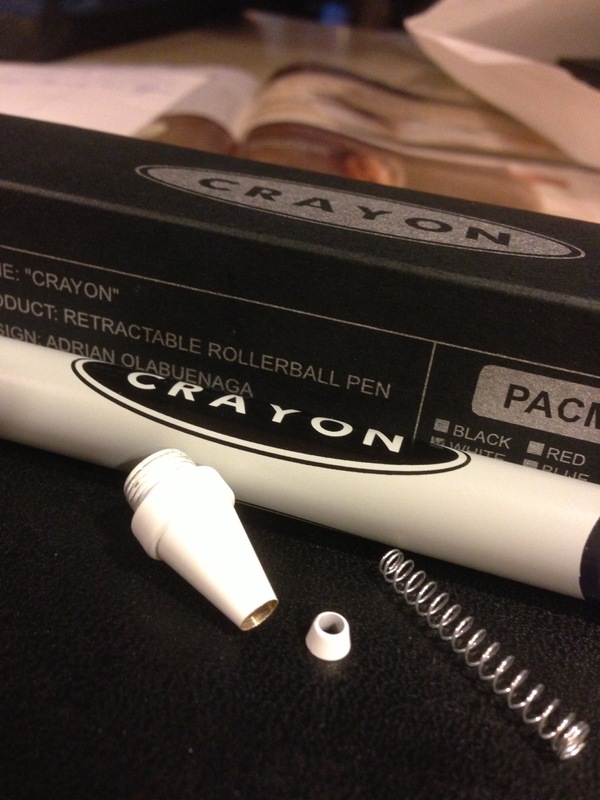 Yup…I dropped my precious white ACME Crayon rollerball on a counter at work, and it hit in such a way that the top of the brass crayon “cone” sheared off. Totally my fault. I emailed ACME Studios, explained what happened and sent the picture, hoping that the damaged piece could be replaced (on my dime, obviously). When I didn’t hear a peep, I tweeted the same photo and story to @AcmeStudioInc. Nothing irks me more than no response. I’ll take a “sorry, tough luck” response over no response. And so I remain irked. 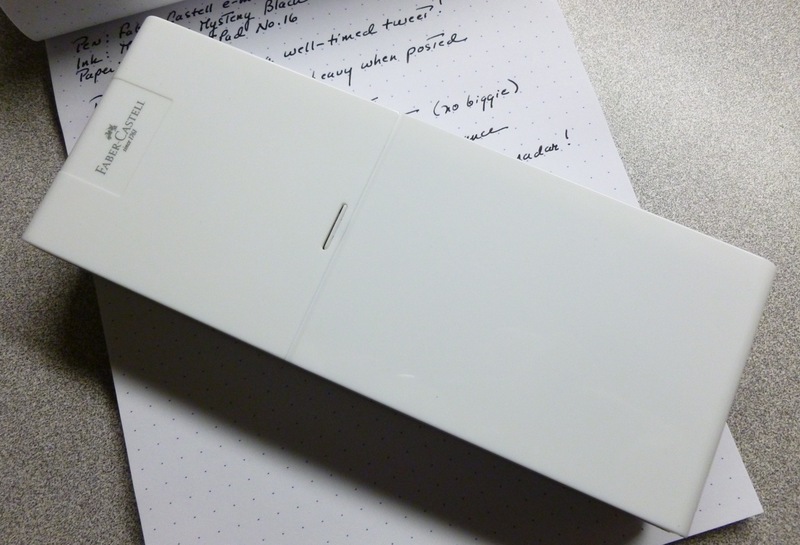 I’ve backed a number of pen projects on Kickstarter, and have received a number of very cool pens…one WAY ahead of schedule (thank you, David! ), but most a few months after the expected ship date. Communication has, at times, been spotty, but in the end, I always wind up with my pen. Until now. No matter how slowly a project has progressed, NOTHING compares to the wild ride the 321 backers of the [md]-pen have taken (myself included). It all started out very normal oh so many months ago, but deteriorated to the point that I’m 99.9% sure that there is no pen. And yet the charade continues. Over the course of the project’s history, there have been tales of manufacturing woes and misunderstandings, an admission that the creator’s profile photo (since taken down) DOES NOT BELONG TO THE CREATOR, tales of computer hacking, stolen images, and stolen ideas, countless lies, no follow-through on promises, and giant gaps between updates. I can’t even begin to explain the whole saga, but you can read about it here. Kickstarter projects are not guaranteed. I understand that. If a project fails because of an unforeseen complication, so be it. But to feel defrauded is an ugly feeling. A pretty awful feeling. Things can and do go wrong, and when they do, companies would be wise to treat these hiccups as opportunities to show their customer service strengths. Happily, a number of my favorite pen companies and vendors do just that. Some certainly have room for improvement, while others simply disappoint. All of this made me think, as I go throughout my day, how am I treating my “customers” (for no matter what we do, almost all of us are dealing with people who we could call our customers)? Where am I on the scale of TWSBI to ACME? (Let’s ignore that Kickstarter debacle as a true outlier.) Where do I shine, where can I improve, and where do I disappoint? Hmmmmm. May we all be a little more TWSBI. Updated to add: Just after posting this, I received an email from Levenger with the tracking number for my ink. IT HAS SHIPPED. 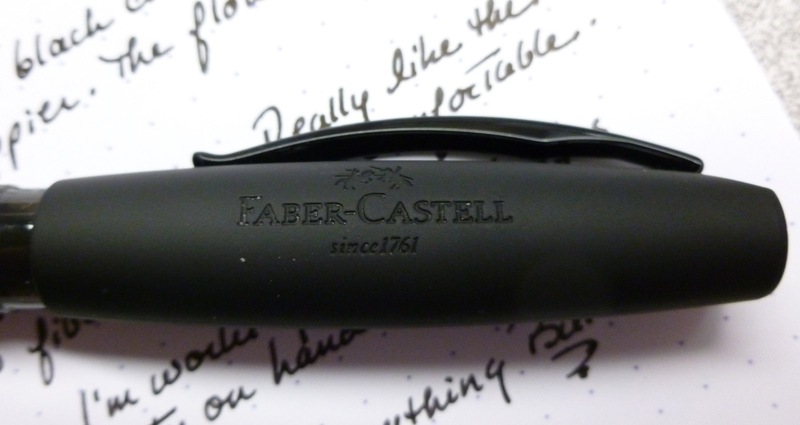 Because I’m so pleased with the look, heft, and performance of my Faber-Castell e-motion pen, I did a bit of research on the brand, and liked the look (and price!) of the BASIC Black model. Amazingly, a few days after adding the BASIC model to my pen wish list, it popped up as the Daily Special in an email from the Pen Boutique, for a mere $28. I think you know the rest of the story. So what do I like, besides the price? Let’s take a tour. As I’ve said before, there’s something about carbon fiber that grabs me every time. And carbon fiber for $28? Unheard of. I can’t find anything that says that this is pseudo-carbon fiber, so I’m assuming it’s the real deal. The subtle checkerboard effect is quietly cool. 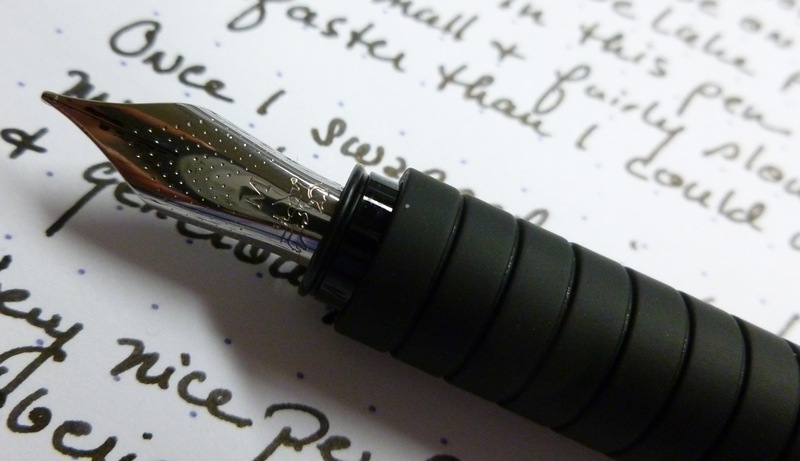 The pen has perfect heft, but is not as heavy as the e-motion due to the lack of a metal cap. Ooooooo…one more thing…the barrel is long enough to hold a spare ink cartridge so you’re always prepared to write. At 1-1/2″, this is a good-sized grip. And it’s rubbery, so it’s nicely grippy. The rubber is quite firm, but not SO firm that it winds up being slippery. The evenly spaced grooves add a bit of interest and “tread,” so holding on feels natural and easy. So smooth. And quite wet. I’d say that this pen runs a hair wetter than the e-motion. In fact, the wetness was a bit of a challenge at first. I initially inked the BASIC pen with a Private Reserve Lake Placid Blue cartridge (a converter is not included, and I don’t have a spare, as yet). 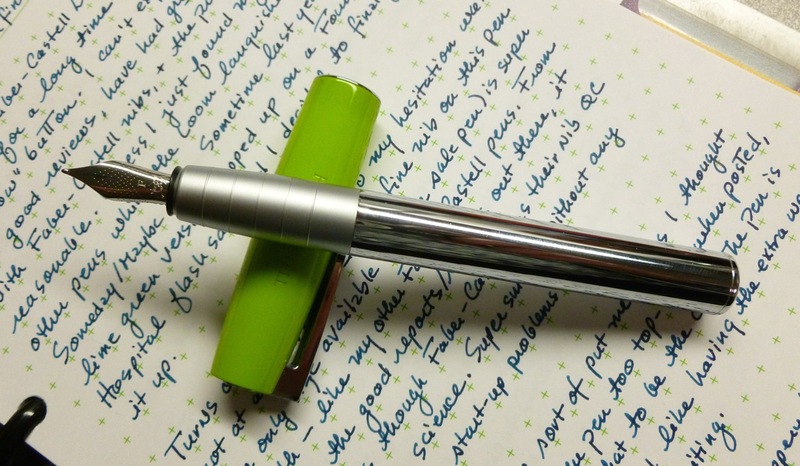 I love that color, but I write small and fairly slow, and this particular ink in this particular pen was super wet. I had trouble keeping up with the ink. After a bit, I swapped in a Levenger Black cartridge, and the flow became much more manageable. 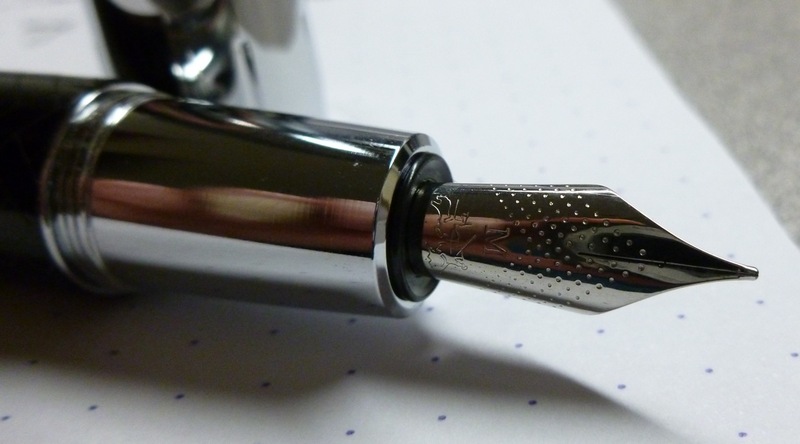 The nib is a medium, so the flow is generous, but it’s no longer a gusher. In fact, I quite like the bold, smooth flow now. Every now and then I experience a touch of a hard start at the beginning of a writing session, but once I get going, the flow is fine. That issue, I suppose, could also be related to the ink as I don’t recall noticing that with the Private Reserve cartridge. 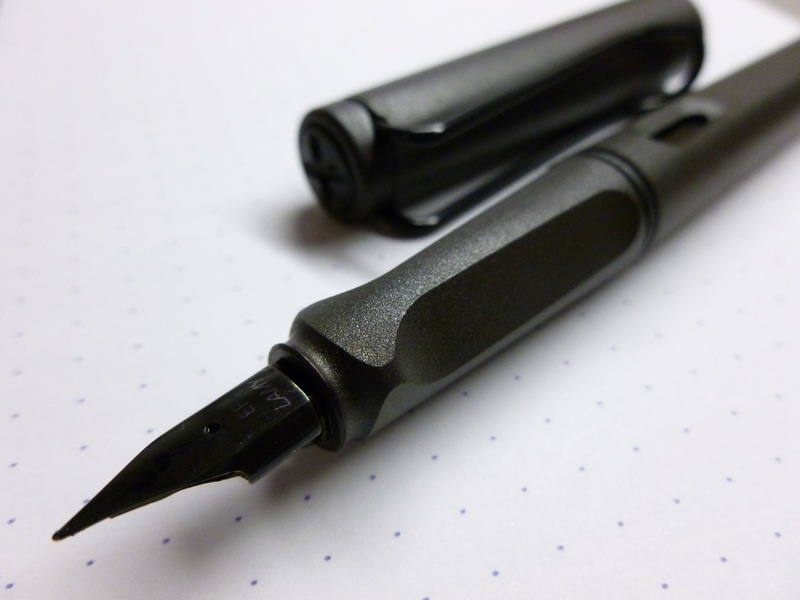 Like the grip, the cap is also rubberized, which gives this portion of the pen a nice black matte look. The branding (name, logo, and founding date) is imprinted into the cap, so it’s there, but barely so. A classy look, I think. I do find that crumbs and lint tend to find their way into the imprint (grrrr…look at the “F” below), but it’s not really noticeable until you blow up a photo. The cap snaps into place with a firm and convincing click. 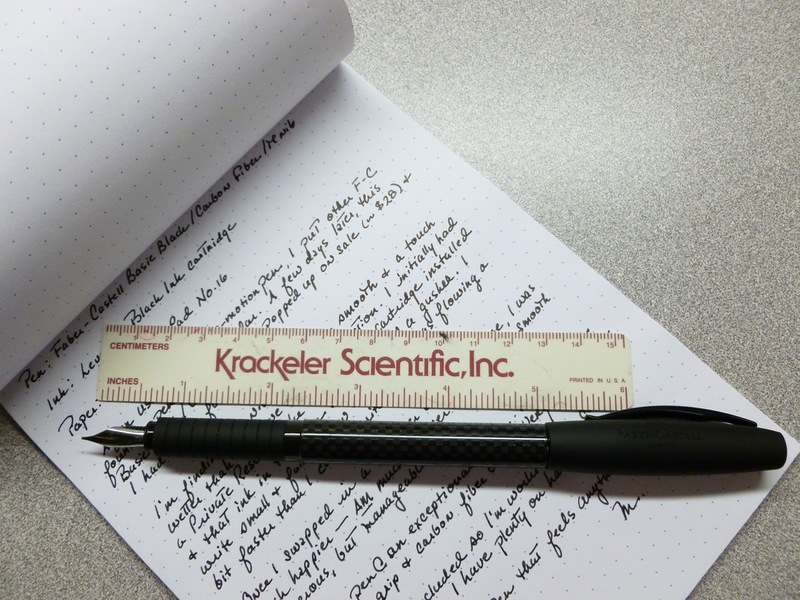 Posting the cap makes the pen too looooong to hold (7-1/2″), while the unposted pen measures 5-1/4″ and feels just right. The clip has a cool looking profile and is very strong and springy. Great attributes in a clip. 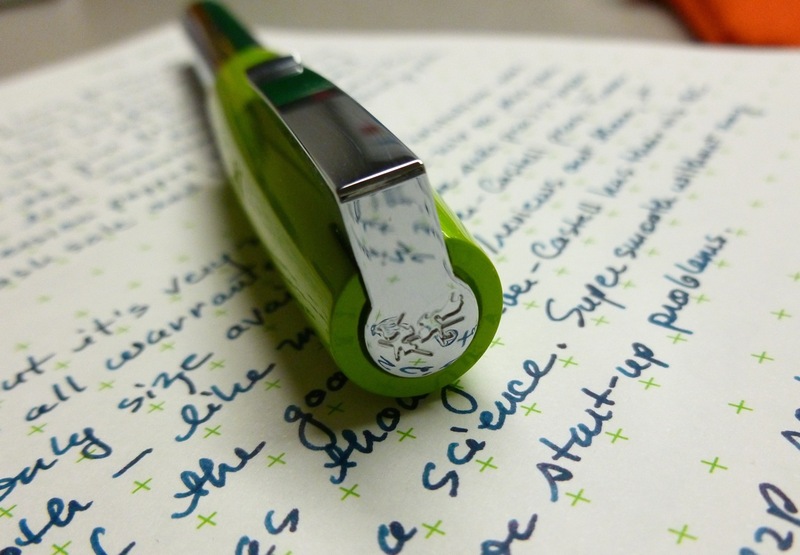 Because of the grippiness of the rubber cap and the springiness of the clip, the pen stays put. No worries there. 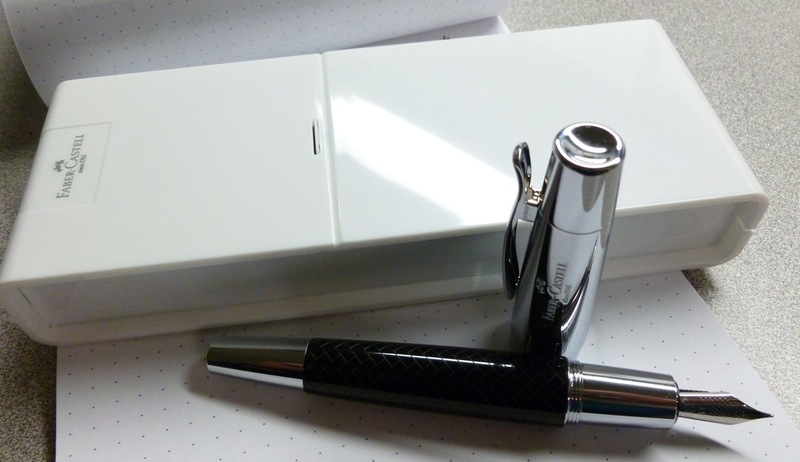 According the the Faber-Castell website, the BASIC line is also available in Leather and Mother-of-Pearl (and as ballpoints and rollerballs). Pretty much something for everyone. When I hear “basic,” I think stripped down and generic. Though this pen has simple lines, it’s full of Faber-Castell goodness. Nothing BASIC here.